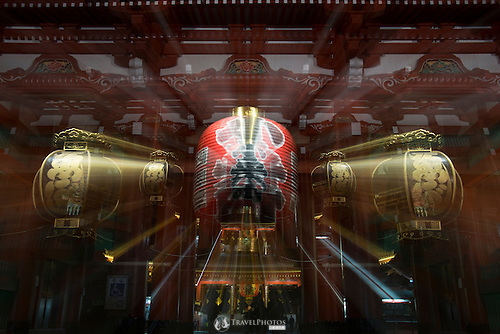 Having a bit of fun photographing the big lantern at Sensoji Temple, Asakusa. What a day it was. I had spent the afternoon before walking around town finishing the Jazz Improv collection, and then I spent the morning in Kyoto at Fushimi Inari walking up the mountain and down again. Oww, my calf muscles hurt. This image is available for purchase. A close up of a lantern with the famous torii (gates) of Fushimi Inari Shrine.